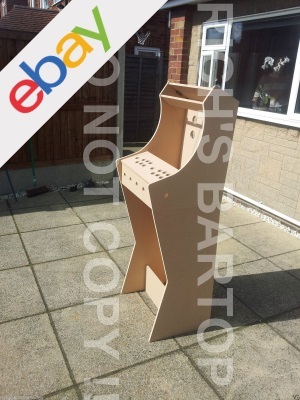 I purchased mine as a MDF flat pack from eBay by a seller called richsbartoparcades. I would recommend them. I choose the compact bartop and pedestal combined version here for £125.99. It does not use up to much space and you can also just move the bar top section. Handy when my Nephew is over and I don’t need to bring the whole machine downstairs! When it arrived, the flat pack was a little confusing. It was a bit of guesswork at first, but got the hang of it after a while. I assembled it using plastic fixing blocks, as recommended. I got them from ebay too, something like the link below. Once all assembled, I undercoated it, lightly sanded, then painted using a small roller with a black gloss paint. I then used 12mm silver self adhesive car trim on the edges, see photos in my blog. This was from ebay too. Something like this link. For the monitor I used a 19” LCD from ebay. You will need to make sure it is 4:3 proportions. Widescreen would probably be too wide for the cabinet, and the dimensions would look odd for the old games. I purchased mine from a seller called skytech-outlet, he still sells used monitors for £24.99. Once the monitor is all fitted, I measured the size required for the acrylic screen and the marquee. I got this cut to size from a site called acrylic-online.co.uk. I went with the 4mm clear acrylic. This cost £18.42 inc postage. More details of this can be found on my blog here. The cabinet will fit the standard arcade joystick and Happ buttons. 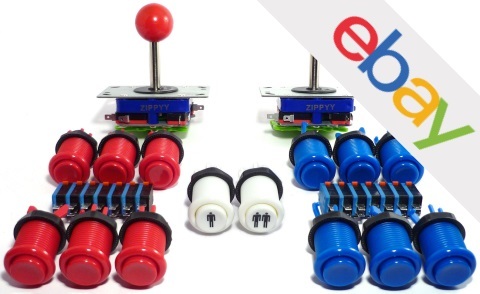 You can get a button and joystick pack for about £30, like the link below. If you have the same cabinet as me you will need to buy 5 more buttons for the front and sides. Have a look around there is a lot of choice, different colours etc. At this point you have a choice on how to play the games. 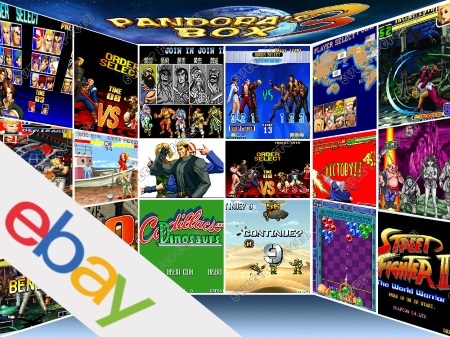 The most common way to do this is using a PC and run some software called MAME that supports 1000s of arcade games. Or you can use a JAMMA board. Both options have their advantages, and disadvantages. I’ll try and list them so you can decide. BAD computers can be unreliable, could spend more time fixing them than playing! That’s it! Here’s the full shopping list, it’s surprising how much it adds up!